Continuing with the theme of earthy perfumes for spring, today I am talking about one of my relatively recent discoveries in the genre, Onda by Vero Kern. Swiss perfumer, whom Andy Tauer reverently calls his mentor, Vero Kern started Vero Profumo with three fragrances, of which Onda is my favorite. With notes of vetiver, ginger, mace and coriander, Onda is described by the creator as "a flying carpet that takes us to the secret places of our deepest longings". My perception of the perfume is less exotic. Perfectly representing the green, earthy and, for the lack of a better word, almost bready smell of vetiver, Onda is a rustic scent for me. It is the smell of freshly ploughed earth, of hay, of wet grass, of wooden houses, of peat, of smoke in a chimney... A comforting scent, an urban person's vision of bucolic utopia. Another aspect of Onda that should not be left unmentioned is its sensuality. It must be the spices that infuse the no-nonsense vetiver note with warmth and indolence and, yes, "deep longing". So put together "rustic" and "sensual" and what we have in Onda is another perfume for Lady Chatterley. Onda can be found at veroprofumo.com, $145.00-$230.00. Samples sets of the three scents are also available, for $20.00. 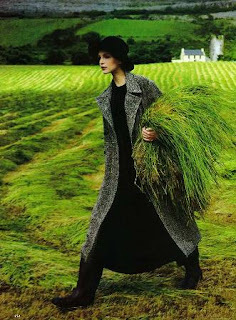 Photograph is by Arthur Elgort. Vetiver, ginger, mace and coriander? Yum! Oh my lord, but I love this perfume! Almost daily I engage in an internal debate as to whether or not I need to eat. It's almost drug-like to me. It literally makes me feel all good inside and I want it sooooo baaaaad!! What a great combination of scents. The "freshly plowed earth" is all about Lady Chatterly, but maybe we can steal the fragrance while she's otherwise occupied. I agree - Onda is all about the great outdoors. Garden or field work, the well-worn wooden handles of your tools, the smell of earth, plants, herbs, the odd cat wandering by. The well-earned drink in the evening sun on your wooden doorstep after your work is done. Ummmmm.... maybe more of a scent for Lady Chatterly's lover? If I get up the energy to swap on MUA again, I want to smell this sometime. It seems that the people who love it, REALLY love it, and the notes sound wonderful. You know, I really like this perfume, but I keep hearing that it's an updating of Djedi, and it is NOT the same (or even that similar) on me. I do like it a lot, though, and I wish it were more affordable. Love that photo! And your review has convinced me to spend more time sampling this scent. Like Judith, I don't find it to be similar to Djedi on my skin, but I need to just try it and let it be what it is. Am waiting with bated breath for Vero's perfumes to arrive in my mailbox. Your lovely review and Gail's comments are leaving me in a state of fevered anticipation. I would love to try Coty Wood Violet! It is definitely worth an effort, I think. I don't find it similar to Djedi either. They both have vetiver, that's about it similaroiy-wise, imho. I would love to hear your opinion, when you receive them. I love this so passionately. That translates as " not to work, not near DH, blahblahblah". I find that it engenders a very primal response- either positive or negative- in others. People react VEHEMENTLY to it. It feels both fiery and earthy [ that covers some of my chart nicely ! ], very singular. What an amazing creature the beautiful Vero is- inside, and out. At the risk of sounding like a grumpy old fart, this line hates me. Onda hates me. I am glad lots of other people are feeling the love, though. Vero Kern seems like a really interesting person. Still struggling w/ Onda. I ought to love it, but I don't. I struggled at first too, so you never know. I'm curious about Onda. What other scents, with vetiver or not, you think might relate to it? Strange as it sounds, to me, it would be Kolnisch Juchten and Fleur de Narcisse. M--so glad to see your review of this scent. I was quite amazed the first time I tried it. Rising up all around me, from the tiny dab on my hand I got something that smelled vintage, classic to me -- not rustic at all, though I totally see what you mean once the vetiver kicks in (grrrrowww!). In fact, in the opening it reminded me a lot of Chanel's Cuir de Russie of all things. Has the power of Onda broken my nose? Did you smell any leather in this? Yep. Just compared it to Kolnisch Juchten of all things, in my reply to Edwardian. Kolnisch Juchten (which I'd never heard of) and am so delighted. It's the Lady Chatterly connection!